Quebec Premier François Legault responds to the Opposition, during question period on Feb. 6, 2019, at the legislature in Quebec City. The Quebec government has proposed a bill to reset the province’s immigration system by cancelling a backlog of 18,000 applications, matching more immigrants to job demands and opening the door to a test for French language ability and values such as equality and human rights. 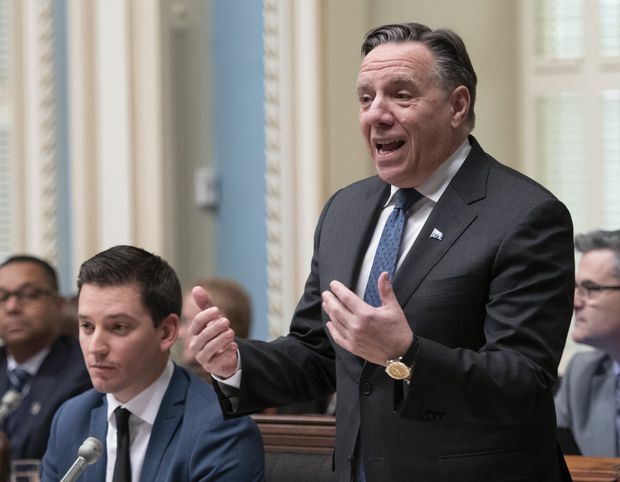 Premier François Legault’s government did not detail Thursday how it would deliver on an election campaign promise to impose language and values tests on immigrants after three years in Quebec. Instead, Bill 9 drew a broad framework that could enable such tests along with more focus on matching immigrants to job openings. The draft law proposes to beef up powers to “accompany and verify” learning of language and values without saying how it would revoke Quebec selection certificates or residency from those who fail. The bill also proposes linking permanent residency status to a commitment to live in regions outside Montreal. That proposal sets the government up for conflict with Ottawa, which controls residency status for immigrants under the shared federal-provincial arrangement. Immigration Minister Simon Jolin-Barrette said the goal of the legislation is less about punitive measures and more about addressing labour market and regional needs for everyone’s benefit. In an ideal world, the co-ordination among regions, employers and immigrants would resemble the Tinder dating app to match interests swiftly, Mr. Jolin-Barrette said. The backlog of 18,000 files to be thrown out fall under Quebec’s qualified workers program. The system currently treats the applications on a first-come, first-served basis. Mr. Jolin-Barrette wants to start fresh with matching immigrants with labour market needs as the top priority. “This legacy of the old system is an obstacle when Quebec has a labour shortage in various sectors and regions,” Mr. Jolin-Barrette said. Outstanding cases will benefit from the new process, he said, because the goal will be to deal with files in six months instead of 36. While the minister described his approach as “human and respectful,” Mr. Handfield said the news will be devastating to some families that have invested time and money in the process. The 18,000 files represent workers and family members and include more than 50,000 people, many of whom already live and work in Quebec and are awaiting permanent status, Mr. Handfield said. “I have no doubt some of them will sue,” he said. Dominique Anglade, the Quebec Liberal Party’s immigration critic, said the decision is inhumane. “These are real people, but on top of that it sends an unfortunate message internationally,” she said. Some of the cases date back to 2005 and the average wait is approaching three years, the minister said. The bill comes after the government cut immigration levels to 40,000 from 52,000 last year. The government was elected in October on a promise to take in fewer immigrants but do a better job integrating them.